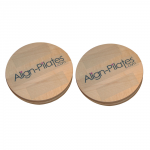 Rotational Disks range from Pilates brand Align-Pilates can be used to develop and improve balance and strength through rotation of movement, either by standing or sitting positions. Perfect for Pilates moves and rehabilitation alike, the disks can be used during mat work alongside other Pilates Small Equipment. View the full range of disks currently available below.